Traditional style Nose Rider Log, Easy to ride, Slides, Glides and Super Fun. Single Nose concave Vee bottom, 50/50 rails no hard edges. Cut Laps, Pigments, Tints , Inlays and custom classic artwork. Laminated with wieght and momentum in 9oz and 6 oz Volan. 9'4" x 23" x 2 3/4 - 3 1/4"
9'6" x 23 1/2" x 2 3/4 - 3 1/2"
9'8 x 23 1/2 x 2 3/4 - 3 1/2"
10'0 x 24 x 3 1/4 - 3 1/2"
A modern cruiser longboard with volume, heaps of paddle power and plenty of glide. Traditional template, soft 60/40 rails with a rolled vee bottom blending into a soft vee through the middle becoming harder in the tail. Chamfered forward rails pinched high to stop the pearl, with a long tear drop nose concave for easy nose riding. Fun fun fun. Glassed to last 9oz bottom, 9 + 6 deck. Glossed and polished. My first surfboard shaping logo was Rising Sun so when I was looking for a new model name this one seemed like a good fit. I wanted to make a Californian style log but with off the tail performance. In a Paua shell this board catches waves insane, trims, locks in nose rides and turns on a dime, a great board for beach breaks and fast breaking peeler log waves. This board has a relaxed rocker with accelerated tail curve which is late and starts right on the hip of the outline tail end. A deep tear drop nose concave runs back just past center and blends into a rolled vee becoming more of a panel vee at the fin box. Rails are soft 50/50 pinched high in the tail, decks pretty flat. Glassed in 7.5oz bottom / 7.5oz bottom + 6oz + deck patch. The Hot Log is a performance based single fin longboard. This board originated from the need for a smaller narrower log, perfectly suited to the Girls who want a longboard that surfs small waves really well and is easy to move around and carry! The boys got hold of one and ripped so I just kept refining it. It's best at 9'0 , 9'2 and 9'4 any much longer and it's just to fast and out runs the sections for nose rinding. Pulled in tail , Pulled in nose and moderate rocker curve i.e it's not an ironing board. The bottom shape is a tear drop short nose concave set inside a fee bottom. Low volume pinched 50/50 rails , diamond tail. 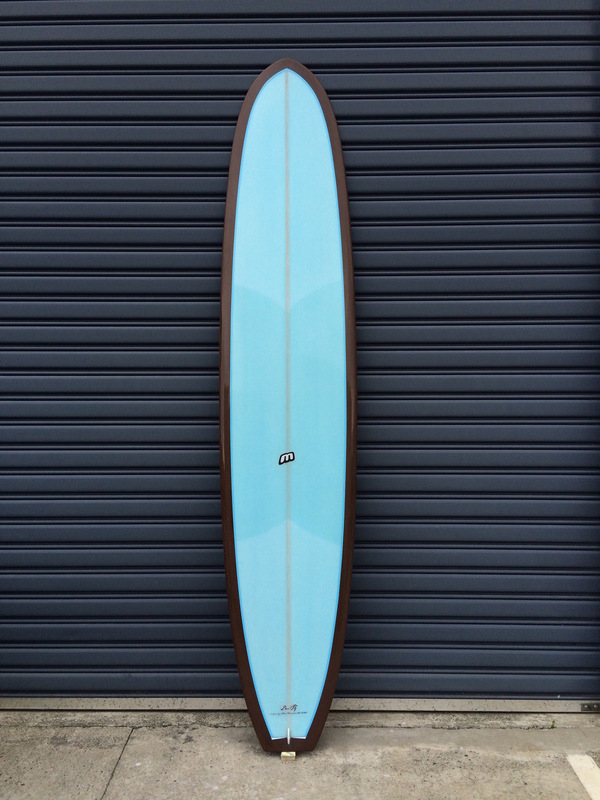 This board is fast and is most suited to surfers who want a log that turns off the tail and nose rides with ease, great alternative to a High Performance Longboard.